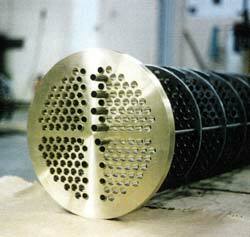 Complicated calculations are required in heat exchanger design and application. Some of them involve elaborate theoretical work, some entail multitudes of separate computations. Most of the thermal and mechanical calculations are beyond the scope of this site. However, a few of the basic formulas and mathematical concepts are quite useful, They provide a good working grasp of the heat exchanger application problem. Also, their understanding has proved most helpful to people whose specialties lie in other fields, but who have occasions to participate in the selection and procurement of heat exchanger equipment. For those reasons, the fundamental mathematical expressions are outlined here. Terms are defined in an informal way, and their significance is discussed briefly. If your work requires a more complete discussion of this topic, we recommend that you refer to textbooks on heat transfer - or contact CMS directly.